and then the Book Love Foundation. 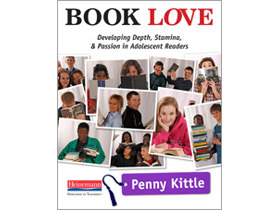 In Book Love, Penny Kittle wrote, "I believe every child in America needs access to books that will keep them turning pages, racing to the end, discovering new ideas and learning to understand the diversity in our world. I believe all children deserve books they can and will want to read and teachers that will guide them to improve as readers.... Every classroom should have hundreds of books to inspire curiosity, hope, and vision for the future." The Book Love Foundation supports teachers who demonstrate a commitment and passion for promoting reading for all students by donating independent reading libraries of a wide variety of fiction and nonfiction books proven to engage adolescents. Each year, the Foundation seeks passionately committed teachers who will aim instruction towards increasing volume, stamina, and joy in reading in middle and high school. The Foundation then provides selected teachers with starter classroom libraries of 500 books, funding as many libraries as it can from the donated money it receives. Heinemann, publisher of Book Love, and Book Source both generously fund one library a year, as do Penny and her husband, Pat. Give the lasting gift of a reading life. After all, where would you be without it?